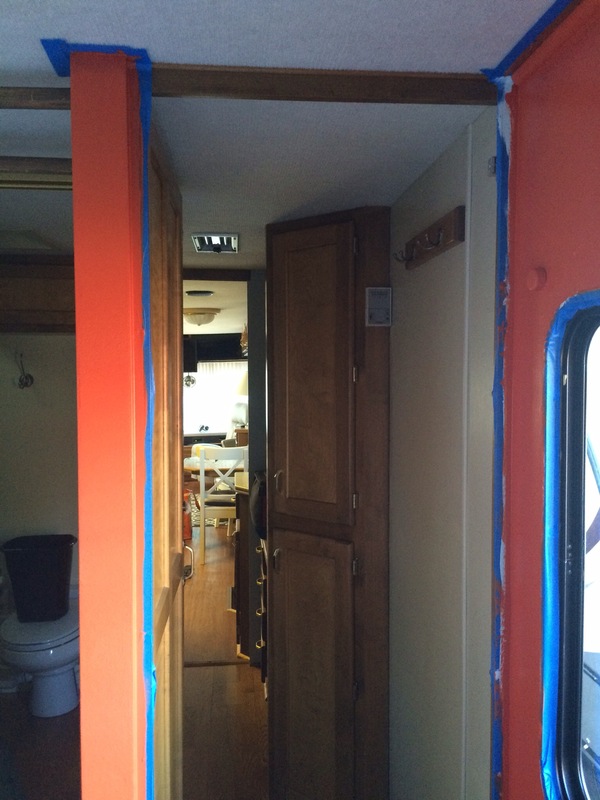 When we can’t get out camping in the RV we like to spend time working on it. 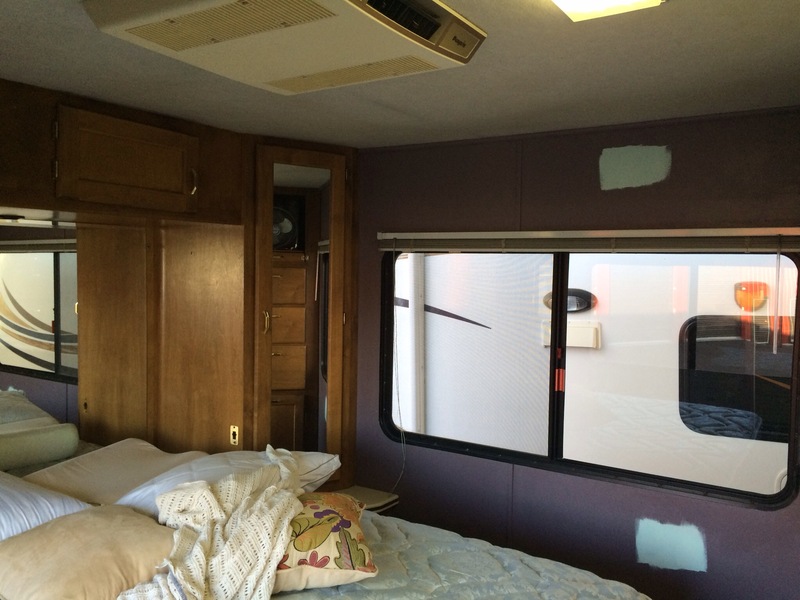 RVs are a bit like boats in that there is always something to fix or something that needs improvement. It’s essentially a big hole you throw your time and money in. Thankfully, we both enjoy fixing things and DIY projects so we do the majority of the work ourselves. 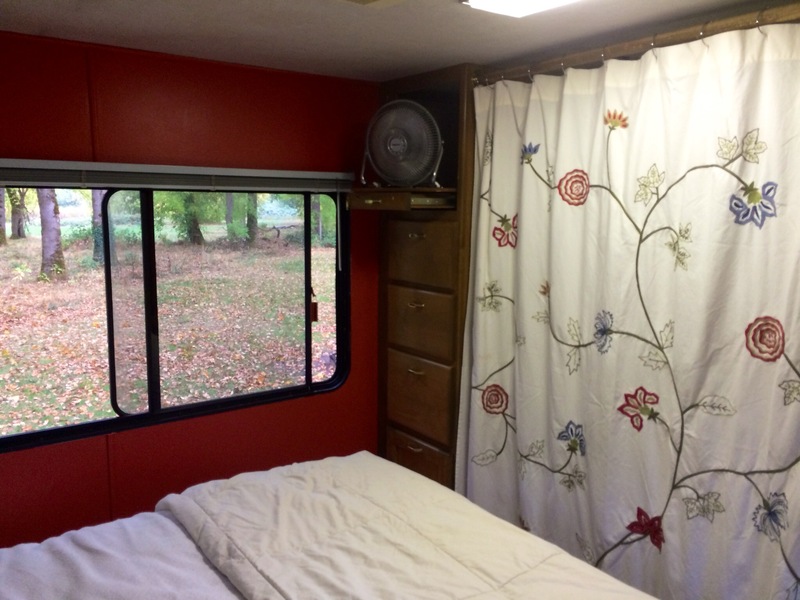 The facility where we store the RV allows us to work on the RV at the storage lot. This is so convienient for us because the RV is too long to park in front of our house. We need to be able to hang out and do projects on site. On Saturday or Sunday we just load a bunch of tools, a six pack of beer, and the dog into the car and drive out to storage for the day. There are also a bunch of resturants, a Home Depot, Walmart, and Target nearby in case we need anything. All of the fixtures on the Alpha 1 are gold. It was build in 1994 and I suppose that was trendy at the time. 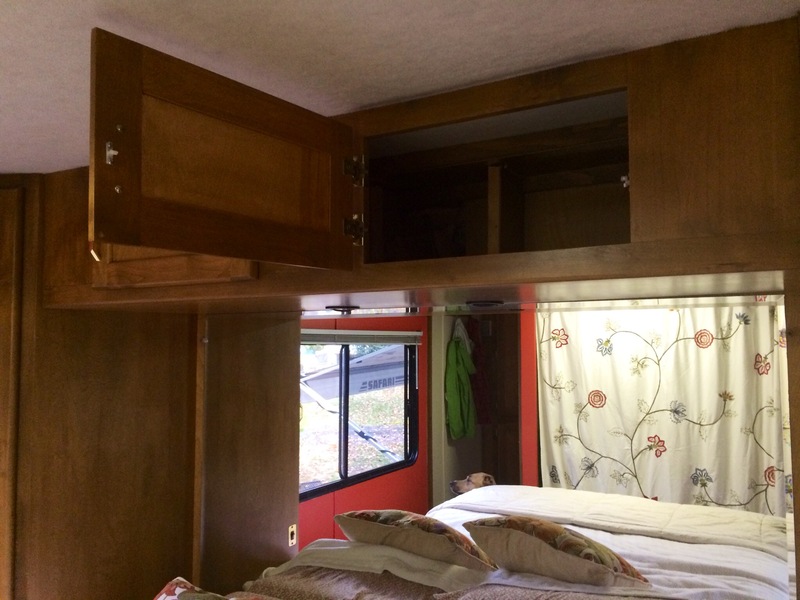 On a modern RV the fixtures would probably be stainless or brushed bronze. We don’t mind the gold too much because most of the fixtures are in good shape. 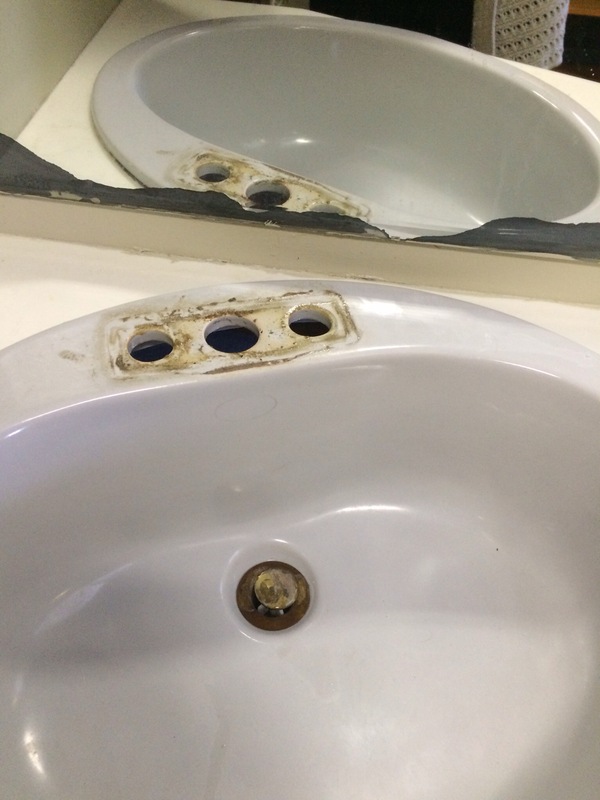 The bathroom faucet, however, was another story. 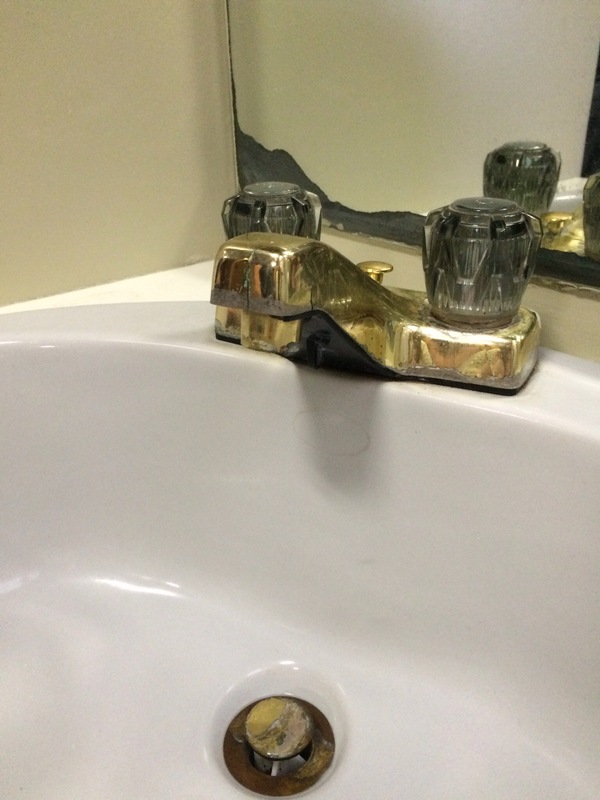 But Brandon was able to pull the old faucet and install a new one in about a half hour. We didn’t even need to make a second trip to Home Depot. It was probably the quickest, most pain free plumbing project I have ever seen. When I replaced the bathroom faucet in our house it took me a whole day and five trips to Lowes. 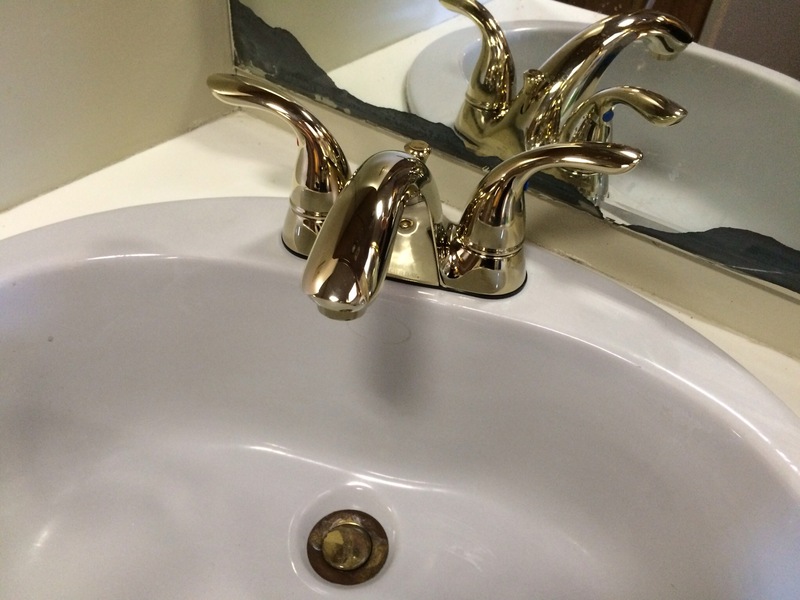 We went with a gold faucet to match all the original fixtures. 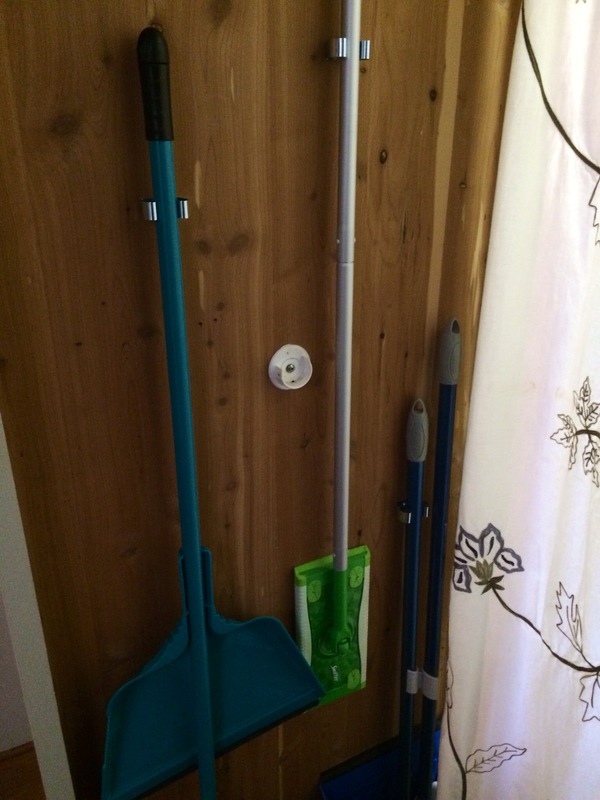 One of the big projects on my list was repainting the bedroom. The previous owners had pained it purple. It was not the most offensive color I’d ever seen but I’ve just never been a big fan of purple. 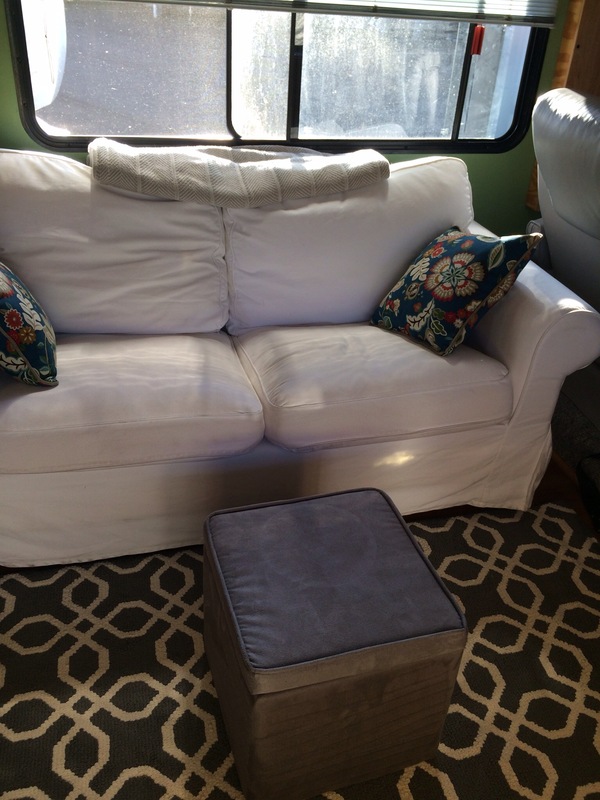 My first choice for the new color was a soft seafoam. It looked great on the sample card but was just too baby blue once I got it on the wall. I just couldn’t let myself paint something baby blue after spending the last four years chasing baby blue out of our house. We think the previous owners got a really good deal on a five gallon bucket of blue paint and proceeded to paint nearly all of the rooms in the house baby blue. We’ve repainted everything except one bathroom and the kitchen. I went right back to the Home Depot for new paint. 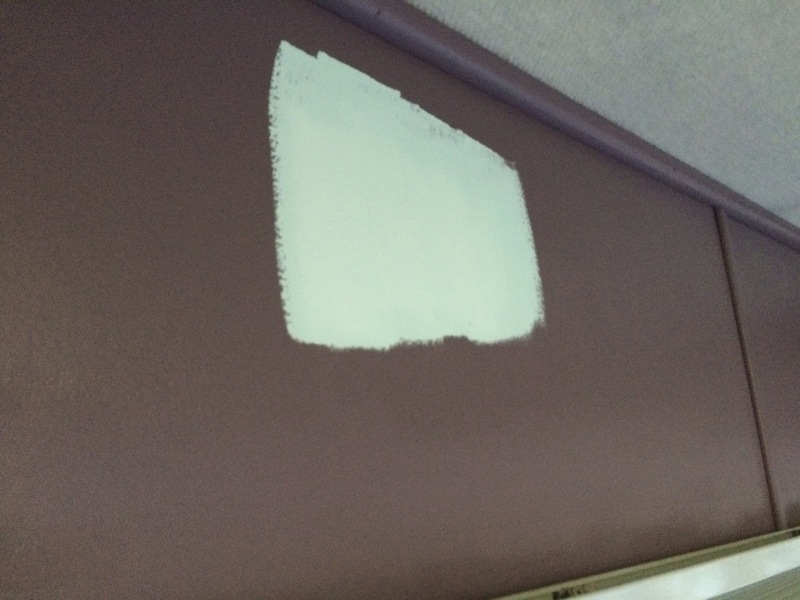 Luckily, you can paint the entire bedroom with a quart of paint so switching colors was not an expensive decision. I went with a nice pumpkin orange instead. 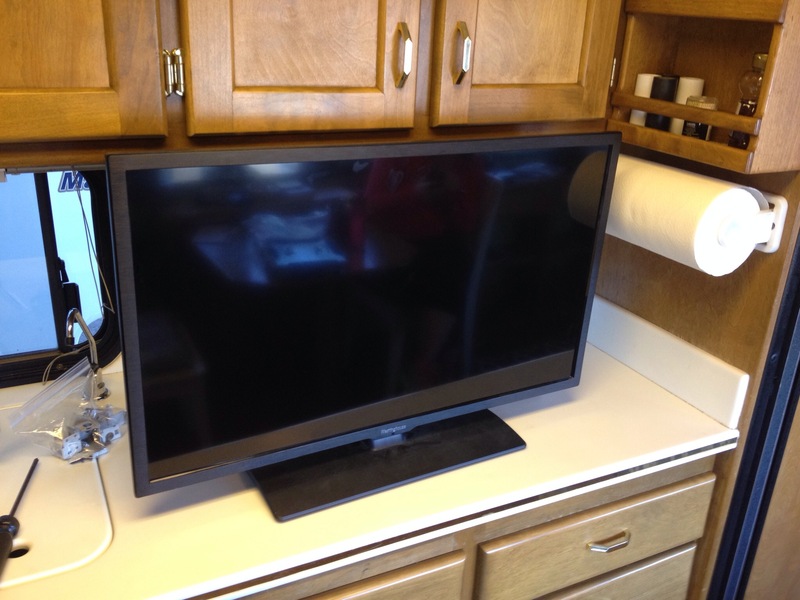 Another big project on our list was replacing the old console TV with a modern flat screen. We already had a TV at our house that would fit. I had it installed on the wall in my office and had been using it as a second computer monitor. 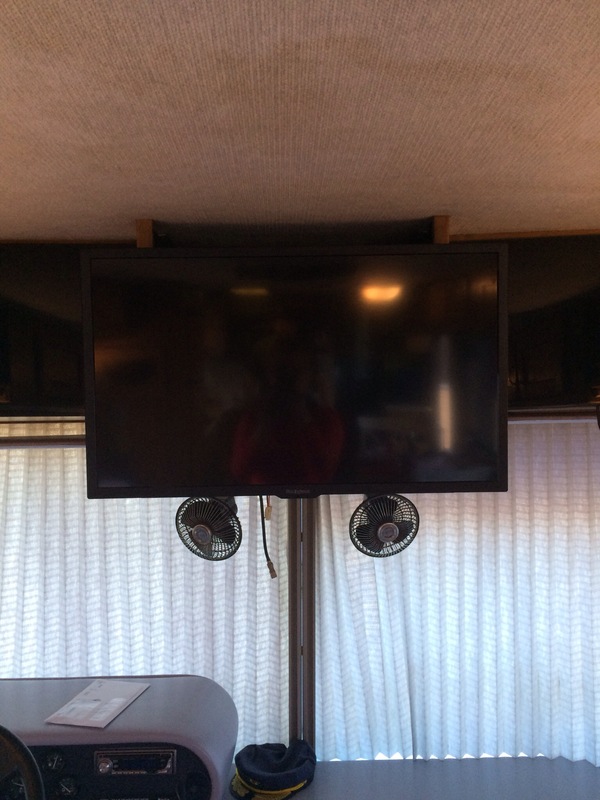 All we needed was a fully-artculating TV mount sturdy enough to keep the TV steady while going down the road and a few modifications to the TV box in the RV. 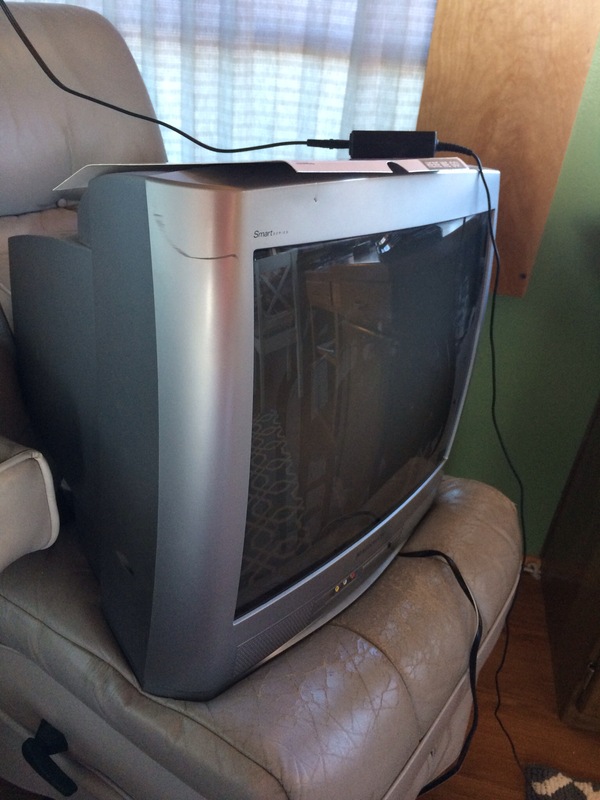 These old TVs are actually a pain to get rid of. They are bulky and heavy. You can’t just throw them away into a landfill and Goodwill won’t take them. Brandon took it to a electronics recycling center in Newberg. At the same time we finally ditched my TV/VCR combo from my freshman year in college. For some reason I was still dragging that thing around. 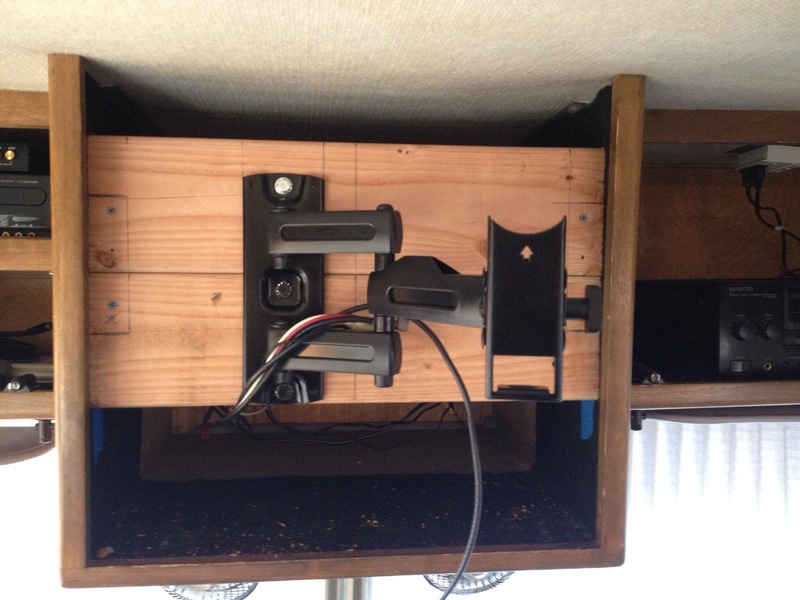 The first hurdle was building a mounting surface within the original TV box frame. It needed to be strong enough to hold a 32 inch TV securely while driving down the road. Brandon tends to overbuild everything so I was pretty confident his plan would work. 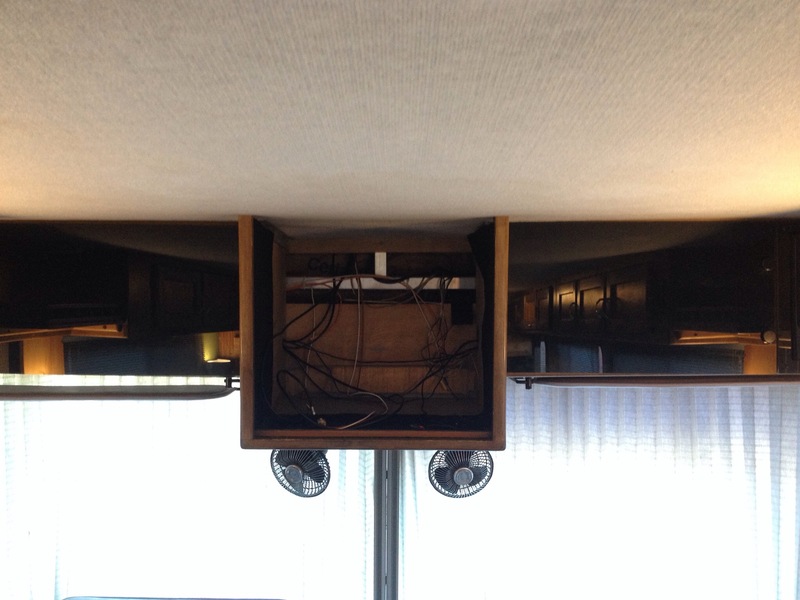 He built a wooden surface on the front, attached to the sides of the TV box, supported by additional boards going to the back of the cabinet and in the center. 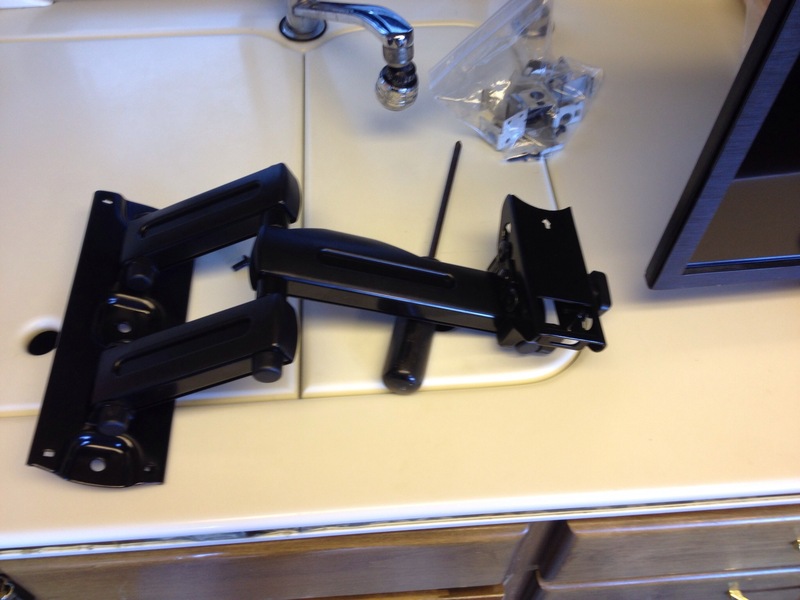 Our new TV mount is a fully articulating bracket designed to hold a 48 inch TV. 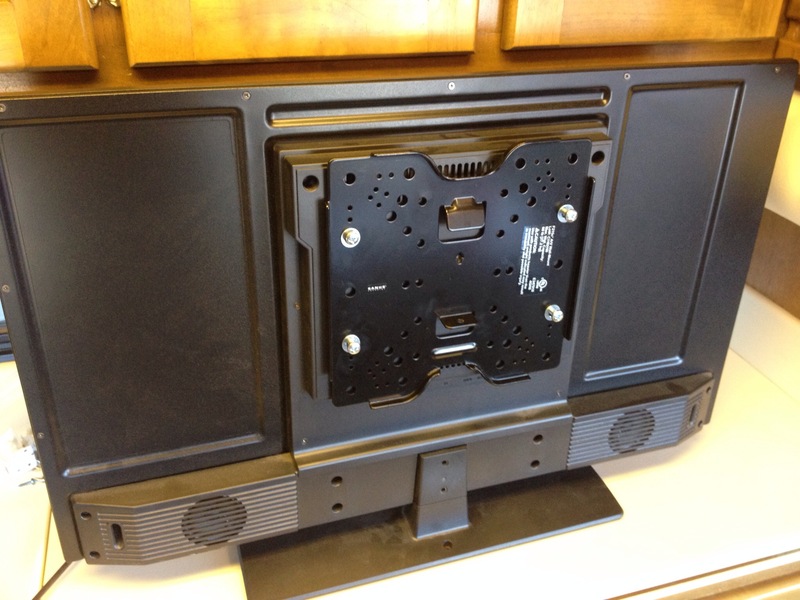 We figured that a mount designed for a larger TV woudl provide us the extra support we need for a moving vehicle. You can see in this photo that the two balck cabinets to the right and left of the TV contain our electronics equipment. 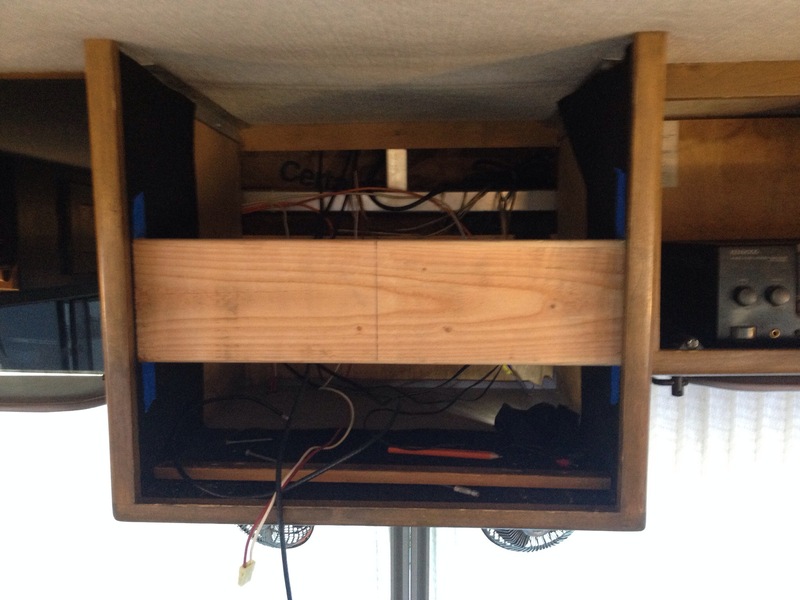 On the right is a stereo system that Brandon has connected to the speaker system already installed in the RV. On the left is a DVD player, an old DVD/VCR combo, and a digital converter box. We mostly just watch TV on Netfix, so all we really need is WiFi. Attaching the mounting plate to the new TV. The finished project is a vast improvement. 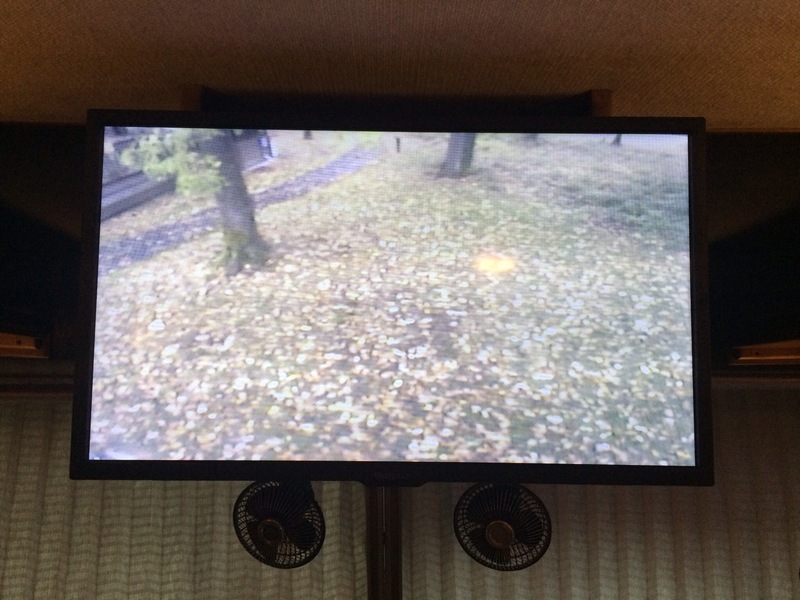 The new TV will also improve the use of our backup camera. 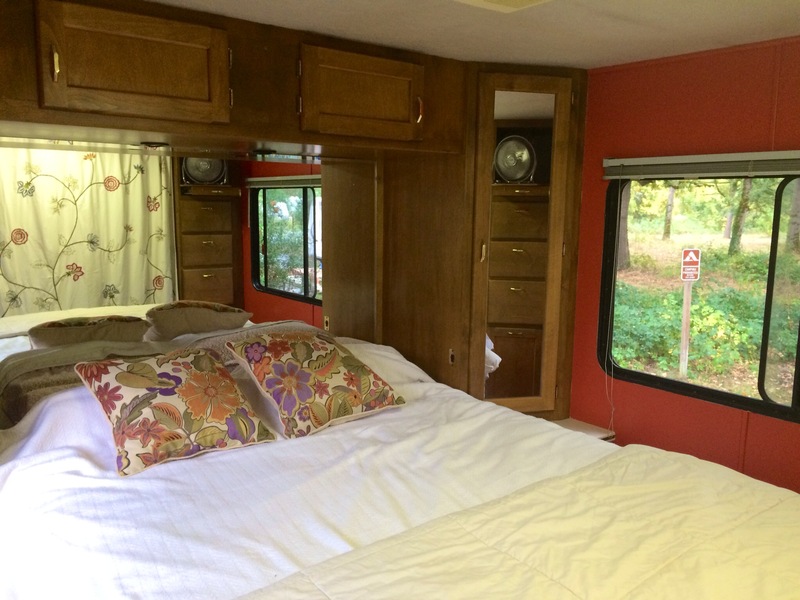 The RV has a built-in backup camera that is invaluable when maneuvering into a parking spot. However, between the old TV and dirt and dust buildup on the camera lens the image from the camera was pretty terrible. After we installed the TV, Brandon went searching for the access hatch to the camera. We found it in the cabinet above our bed. 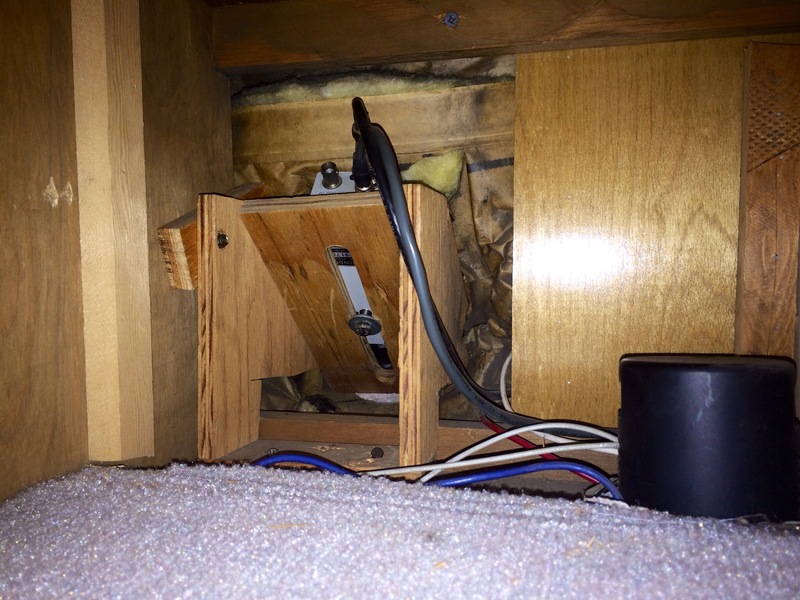 We found that the entire compartment housing the camera was filthy and full of cobb webs. After cleaning out the compartment and polishing the plexiglass the backup camera seemed like new again. 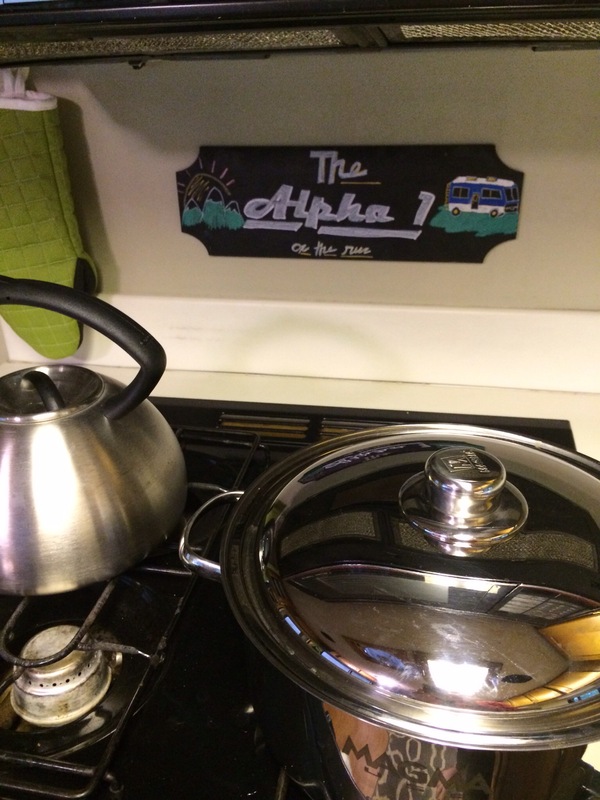 We’ve also been doing some deep cleaning inside the RV and adding some homey touches. I polished all of the wood cabinetry and fixed broken cabinet latches. 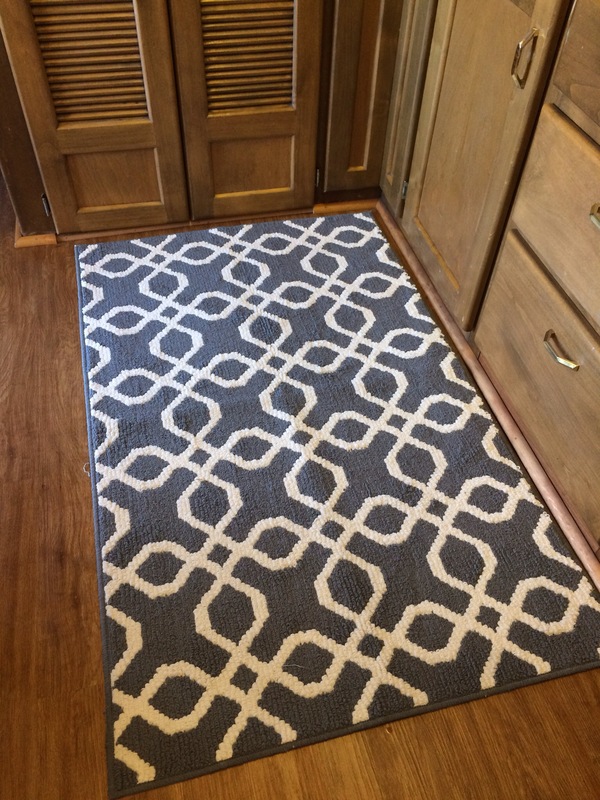 We also replaced the old rugs (which were really just frayed carpet remnants). We think the new rugs really tie the room together. 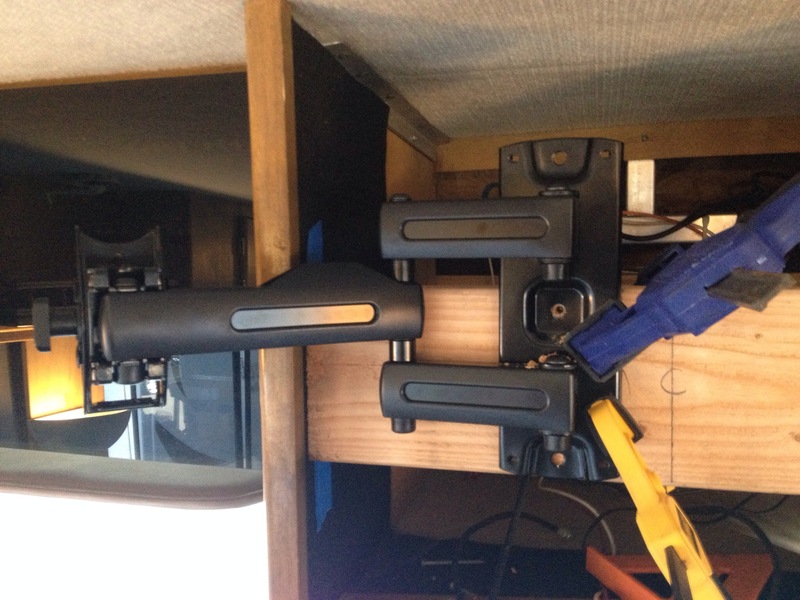 Brandon also installed clamps to hold our broom and mop so they don’t fall down everytime we move the rig. Finally, I made this cute little chalkboard sign to add some personality to the interior decor. Things are really starting to come together around here. Time to go camping! Previous Previous post: Engagement Photos! I really like your chalkboard!! !